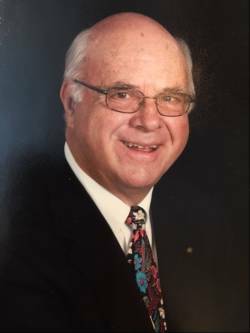 Dr. Robert L. Barker, Jr.
St. Albans - Dr. Robert L Barker, Jr, peacefully passed in the Lord’s arms on Saturday, August 26th, 2017, in Albany, New York, surrounded by his family. Bob was born in St. Albans, VT, on August 14, 1931, the son of Robert Sr. (Pete) and Marcella Perry Barker. He graduated from Bellows Free Academy in 1949, University of Vermont in 1953, and Georgetown University School of Dentistry in 1960. Bob often said that he enjoyed working, starting with pumping gas at his father’s filling station at nine years old, and then at Hefflon’s Grocery Store in the 8th grade. In High School, he worked at Hicks’ Funeral Home. He married the love of his life, Jean Carolyn Spear, of Swanton, in 1953. After the ROTC program at UVM, Bob went into military service as a 1st Lieutenant, serving first at Fort Benning, GA, and then at Fort Meade, MD. Bob was influenced to pursue dentistry by his father-in-law, Dr. Harold E. Spear, a respected Dentist in Swanton for forty-two years. Many of his patients would say that Bob’s humor made their dental visits enjoyable. Bob was the President of the St. Albans Rotary Club in 1971 and was named a Paul Harris Fellow in 1993. He was also President of the Vermont State Dental Society in 1978, a delegate to five American Dental Association annual meetings, a Fellow in the International College of Dentists, Potentate of Mt. Sinai Shriners in 1984, Director of the Montpelier Court of Royal Order of Jesters in 1985, and a 60-year member of St. Paul’s United Methodist Church in St. Albans. After moving to Florida, he and Jean became members of Trinity United Methodist Church in Jensen Beach. Bob and Jean traveled extensively in this country and overseas. Having a life-time fascination with trucks, he loved traveling in their RV after retirement. Bob was a devoted husband, father, and grandfather, a hard worker and an honorable man who put his family first. Known for his humor and the twinkle in his eye, he found the best in life and in people. He woke up early each morning ready for any challenge and looked forward to the events of the day and new experiences. Bob is survived by his wife, Jean, and their three children and their families; Rev. Robert L. Barker, III, and Catherine Miller Barker of Simi Valley, CA, and their daughters, Emily Barker Johnson and her husband, Scott, and Olivia Lyon Barker; Kristen Barker Wallace and Mark Wallace of East Dover, VT and their children, Audrey Faust Wallace and Samuel Barker Wallace; Sally Barker McSweeney and Dr. Tim McSweeney, of Plattsburgh, NY and their children, Connor Spear McSweeney and daughter Lucy Bliss McSweeney. Bob also leaves a brother, Richard Perry Barker and his wife, Barbara Cullen Barker of Bradenton, FL, and several nieces, nephews, and cousins. He was predeceased by his parents, Robert, Sr. and Marcella Perry Barker, and his in-laws, Dr. Harold and Marilla Bliss Spear. Services will be held at St. Paul’s United Methodist Church, 11 Church Street, St. Albans, VT, on Tuesday, August 29th, 2017, at 2 P.M., with a reception following at the Champlain Country Club. In lieu of flowers, donations may be made in his name to the Shriners Hospitals for Children, 2900 Rocky Point Dr., Tampa, FL 33607, or at shrinershospitalsforchildren.org. Assisting the Barker family is the Heald Funeral Home of St. Albans, where messages of condolence are welcome at www.healdfuneralhome.com.